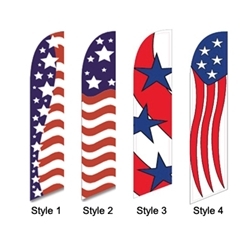 My Dealer Supply - Stars & Stripes<br>"Flag Only" or "Flag & Pole Kit"
THE ORIGINAL SWOOPER! Draw attention to your dealership with these great 15 ft. tall swooper flags. A great tool to get your location noticed! Ourflags are made of quality material. This enables our flags to lastlonger than most swooper flags in our industry. Normal life expectancyof our flags are 6 to 10 months depending on weather conditions andcare. Our Regular Style,which requires wind to flutter the flag to read the message clearly!This style flag has a very slight curve at the top of the pole. In highwind these flags have flown off of the pole. Our spinner fly has solved this problem. Please check into the our spinner fly attachment if you choose our regular style flag and display these flags in a high wind area. Our (N.A.I.) Style, NewAnd Improved, NO WIND NO WORRIES, flags display the message clearlywith out any wind. Our N.A.I style swooper flag allows the flag to spinwith the direction of the wind, which helps to extend the life of theflag. Please look at our pictures to compare styles. We suggest the N.A.I. Style Swooper. **Click Here** to view our swooper setup instructions! !